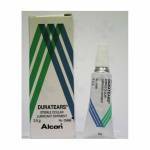 TEARS NATURALE® Artificial Tears is a product of Alcon Laboratories – the world’s leading manufacturer of prescription products made especially forthe eye. TEARS NATURALE is formulated for relief of various ocular irritation syndromes (dry eye). This unique solution contains DUASORB™, a water soluble polymeric system which combines with the existing tears of the eye to promote corneal wetting. TEARS NATURALE provides extended retention time in the eye even though it is not a highly viscous (thick) solution. TEARS NATURALE also· reduces the discomfort normally associated with dry eye conditions. Statistical studies have shown it to be more comfortable than other tear substitutes. – Synergistically utilizes existing tear components to provide a hydrophilic surface on the cornea through normal precorneal tearfilm – corneal surface adsorptive processes. – Enhances precorneal tearfilm stability and promotes corneal wetting through physiological blending with the precorneal tearfilm. – Extends retention time without increased viscosity. – Increases corneal wetting as judged by a greatly reduced contact angle on the clean surface (18°- 21 ° C) (Normal saline = 48°-52°). – Increases precorneal tearfilm stability as evidenced by tearfilm breakup time studies. – Statistically shown in double blind studies more comfortable than any other tear substitutes reported to possess prolonged retention time as well as mucomimetic activity. – Mimics the action of conjunctival mucus.